BOSTON - It took only three possessions for Tech Boston to make the biggest statement of the day at the MLK Invitational. Trailing No. 8 BC High 60-59 with three minutes left, No. 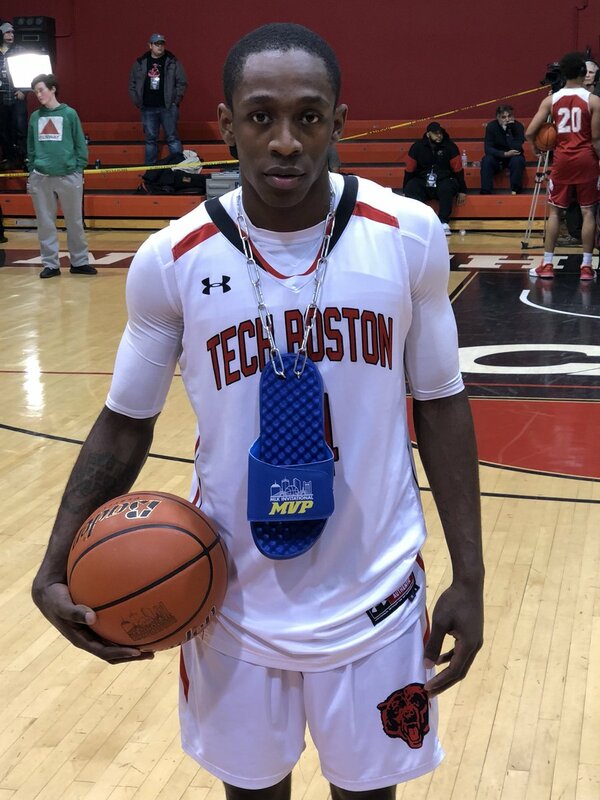 4 Tech Boston went on an 8-0 run, highlighted by a pair of steals from Maurice Works and two baskets by Walter-Dew Hollis, to sprint past the Eagles 74-68 on Sunday night at the Cabot Center on the campus of Northeastern University. Works led all scorers with 26 points and was given the game’s Most Valuable Player award. The Bears used their quickness to slowly wear the Eagles out. In the second half, Tech Boston forced 16 BC High turnovers that led to 23 points. The Eagles held a 38-36 lead after three, and a pair of Spencer Riley buckets kept them in front, 46-45. BC High was then able to get some separation before the end of the quarter as Travis Evee connected on an elbow jumper and a triple around a Matt Thompson three to put BC High up 54-50 heading into the fourth. Down 59-58 the Eagles reclaimed the lead on a Mike Vasil tip in, but from there it was all Tech Boston. Works came through with a steal off a BC High inbounds pass and laid it in at the other end to put the Bears up 61-60. Two Works free throws put the Bears up three and a pair of steal and scores for Dew-Hollis gave Tech Boston a 67-60 edge with two minutes left. BC High pulled within 68-65 on an Evee triple and a Troy Salmans layup, but Dew-Hollis answered with a lay up to put Tech Boston back up five and seal the win. In the second game Catholic Memorial handily defeated O’Bryant, 73-49, behind 15 points, five rebounds, and five assists from Kani Glover. Glover received the games Most Value Player award while Will McDonnell had 17 points. Glover scored seven first quarter points to hand the Knights an 11-9 lead after one. In the second quarter Catholic Memorial started to widen the gap. Glover drilled consecutive treys, and after Jarrett Martin flushed home one of his two dunks on the night, Anthony Morales connected on a corner three to give CM a 24-17 lead. Dasonte Bowen tried keep the Tigers within striking distance as he is layup kept the Knights advantage at seven. With time winding down in the opening half, however, Jaron Flynn went coast-to-coast for a layup to put CM up 30-21 at the break. Defensively, meanwhile, the Knights used their pressure to get the game to their tempo. If the Tigers were able to get it across half court they struggled to hit from the outside against the Knights' 2-3 zone. “Our pressure defense was good," said Catholic Memorial coach Denis Tobin. "(Our team) is a very unselfish group. We have four or five guys that can knock them down and thats what makes us so hard to defend." McDonnell made sure the Knights quelled any hopes of an O’Bryant comeback immediately to begin the second half. The senior lefty drilled four three pointers in the frame, while Martin added seven points to give CM a comfortable 57-34 edge after three.